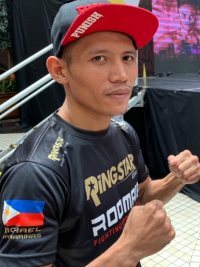 IBO bantamweight champion Michael Dasmarinas will receive Co-Boxer of the Year honors with IBF superflyweight titlist Jerwin Ancajas and WBO minimumweight ruler Vic Saludar at the Elorde Awards Night in the Okada Hotel and Casino, Paranaque, tonight but if he’d lost to Kenny Demecillo in their IBF title eliminator last Saturday, it would be an ironic recognition. There was added pressure on Dasmarinas to beat Demecillo because he couldn’t receive the award coming off a loss. Demecillo wasn’t about to make it easy for Dasmarinas who fought tooth and nail to win by a unanimous 12-round decision, surviving a cut over his right eye from an accidental headbutt in the eighth. Judge Silvestre Abainza scored it 116-112, judge Gil Co 117-111 and judge Greg Ortega 115-113 as Dasmarinas raised his record to 29-2-1, with 19 KOs. Dasmarinas had to be worried that he might join Ancajas and Saludar on the dais tonight on a losing note. So he made sure he wouldn’t be embarrassed. Dasmarinas withstood Demecillo’s body assault and an ugly cut to win handily. When Dasmarinas was cut, Demecillo abandoned his body attack and focused on aggravating the wound. The adjustment backfired. Dasmarinas’ corner did a good job of controlling the flow of blood with Demecillo unable to capitalize. Pulling the plug on the body attack was a relief for Dasmarinas who took a beating downstairs and couldn’t be sure to survive the bombardment.